The exhibit opening reception at the Minnesota Marine Art Museum on September 7, 2010. 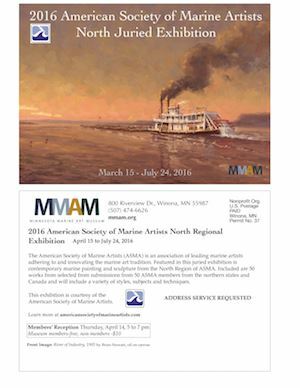 Winners of the ASMA Young Marine Artist competition, Wisconsin Maritime Museum staff and ASMA artists. Casually dressed Wisconsin Maritime Museum museum trustee Carlton Schultz speaks with ASMA artist Albert Petajan (right) at the exhibit opening reception.